This boiler plant upgrade at Springwood Elementary School in Parksville, B.C. included space heating and DHW. Pictured are associate project manager Darcy Pederson of Rocky Point Engineering Ltd., Nanaimo, B.C., right, with School District 69’s general manager of operations Chris Dempster. Archie Johnstone Plumbing and Heating of Nanaimo was the mechanical contractor. In the quest to make our buildings environmentally friendly, commercial domestic hot water (DHW) generation has some promising innovations and gear we can add to our toolboxes. Some technology is new, but many of the best ideas have been with us for years and just need to be applied more often. Demand side management of DHW is currently providing a rapid reduction in energy required short-term, with low flow fixtures and appliances already making a big dent in per capita DHW use. The next steps require development and utilization of reliable, more efficient but affordable DHW generation appliances and less wasteful DHW distribution systems. These are exciting times to be in the industry and there will be many new opportunities for those contractors, suppliers and designers who tackle the challenges head-on and keep up with the latest technologies as they are introduced. I will continue to highlight promising developments as they become available to the market. Given the dire news we see from climate scientists on a daily basis, we need to get busy. In product development, marketing, writing and lecturing over the last 25 years, I have encouraged the industry to approach every job with energy efficiency as a top priority, initially for conservation reasons, but with more urgency now, encouraging de-carbonization of our spaces and processes. There are five condensing boilers. A heat exchanger is connected to one them with a dedicated DHW to boiler pump for DHW “opt-out” operation. Building owners, facilities managers and planners need to include energy efficiency and carbon reduction measures whenever they are contemplating a new build or a retrofit; we can’t continue with business as usual. If we don’t change our ways voluntarily, I believe we will be forced into it by the rapid onset of climate mayhem. Politicians must take the risk to the planet as a given and start getting serious about providing secure funding models for new product research and development, as well as stable incentive programs that the industry can depend on for long-term planning, training, staffing and investment. Our industry can play a key role to help turn things around. I have always been a big fan of solar thermal applications for making DHW – the technology is mature, robust and simple. 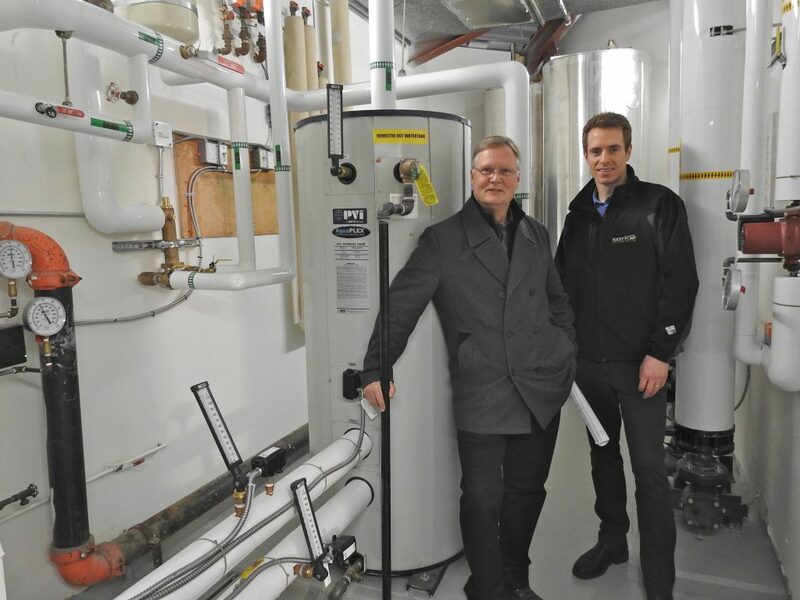 This carbon-free method of generating DHW seemed destined to gain altitude about 15 years ago as renewed interest in these systems encouraged Viessmann, Caleffi, and other competent players to provide complete package solutions here in Canada. These companies made a significant investment in developing the market by supplying high-quality hardware and engineering support to make it easy for the contractor to put together winning systems. A high/low thermostatic mixing valve tempers hot water as required. Alas, claw-back and elimination of many rebate programs stretched the pay-back periods into the far future, killing many promising projects. The recent nose-dive in the price of photovoltaic (PV) electricity generation systems has added to the problem as solar thermal systems have to compete for roof space with PV. There are still a few viable sweet spot applications for solar thermal, but it looks as if it is destined to be a niche product for now. I expect renewed interest in the near future, as architects and engineers look to make their building’s carbon neutral and tweak their designs for extra LEED points. The quest for eco-friendly DHW generation has triggered interest in dedicated air to water DHW heat pumps, but during our Northern climate heating seasons, the advantages for indoor units drop off because they cool the interior space to make DHW. Look for applications where indoor spaces need cooling in the winter (compressor rooms, server rooms and the like) and you might have a case for using these tank-type DHW heaters. Stay tuned though – I am seeing some promising stuff coming at us from the air to water heat pump manufacturers. Geothermal (or geo-exchange) systems are being used increasingly to pre-heat DHW from the superheat, but not every location favours drilling multiple holes in the ground and retrofit situations that can utilize geothermal can be hard to find. In this brave new world going forward, you should always be on the lookout for waste heat or other low-grade heat sources in a building. 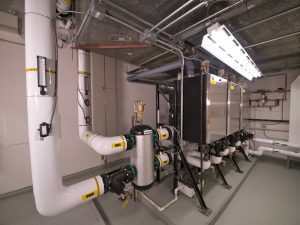 Instead of tossing this heat out of the building envelope, some of it might be used to heat or pre-heat DHW, such as heat recovery from cooling compressors, greywater, and the aforementioned server rooms. The boilers heat the 125-gallon PVI tank through this double-walled heat exchanger. Given the current lack of practical carbon neutral ways to make high demand volumes of DHW, it looks like we are going to be burning fossil fuels for many years to come and it will be up to the industry to do so in the most efficient way possible. Until we can build up a hydrogen infrastructure, natural gas is going to give us the most DHW for the least carbon penalty when it comes to combustion appliances. Condensing gas equipment has come of age in the nick of time. High-efficiency gas appliances can help give us time to develop the necessary technology and infrastructure to bridge the gap between now and a carbon neutral future. Fuel oil is not a great choice for reducing carbon emissions but, in many areas, there is no other practical choice. More efficient oil burning appliances and burner technology can reduce emissions short-term, and those of us who are lucky enough to have access to cleaner energy will have to pick up the slack. The day is coming when renewable energy will be a viable alternative to “dirty” combustion appliances (oil, wood, coal) in remote areas. 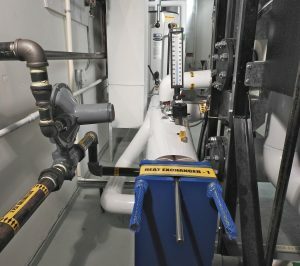 In existing buildings, larger commercial hydronic systems allow high-efficiency boiler room retrofits to include the addition of heat exchangers that generate DHW to a central distribution system. When using condensing boilers, existing DHW heat exchangers may need to be replaced with units designed to operate at lower supply water temperatures to maximize efficiency of the boilers. If the stars align, there are some larger buildings where the DHW system (and possibly the heating system as well) can be de-centralized using regional mechanical rooms to greatly reduce distribution losses and provide redundancy. The compact nature of modern high-efficiency boilers and their flexible venting options make this a viable option. 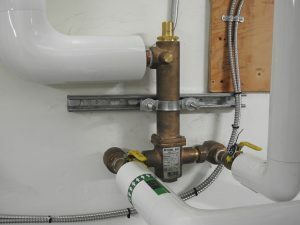 Energy losses from existing distribution and recirculation piping can be “tightened up” by adding insulation to piping, eliminating leaks, and using better components and control strategies. Examples include variable speed pumping, DHW temperature reduction and occupied/unoccupied scheduling. Be aware of both Legionella and scald prevention concerns in DHW recirculation systems. If the water is too hot, methods need to be provided to prevent scalding at the point of use. If the DHW is not hot enough, the piping system can become host to dangerous bacterial growth. The science on this can be complex, so you really need to hire some expertise when it comes to designing or even servicing/adjusting these systems. A careful assessment of DHW consumption, especially after a major retrofit with low flow fixtures, might surprise everyone. The numbers may point to a complete redesign of the system, abandoning recirculation and large distribution piping in favour of point-of-use electric heaters throughout the building. Be alert for this possibility, I think it could become a common retrofit. As mentioned in my previous article, on-demand DHW is developing at a rapid pace and modular installations can serve some very large commercial loads. The design and manufacture of this type of heater is in the process of being refined and fine-tuned for greater reliability, efficiency and economy. Expect to see some higher capacity heavy-duty commercial on-demand heaters in the market in the not too distant future as this technology comes of age. Most of the new “gee whizz” technology we need to develop will require extra training and upgrading for the trades and designers. If you are in the HVAC industry and do not “do” refrigeration or electrical troubleshooting and repair, you are going to find your options very limited going forward. Trade schools are continually upgrading their programs, but finishing your apprenticeship is just going to be the start of your education. Buying new tools and diagnostic equipment, learning how to use the stuff and maintaining it is going to be an ongoing process as long as you are active in the trade. Everyone is going to have to step up. Looking only at simple payback formulae are not going to get us to where we need to be. Future generations will either thank us for our effort or condemn us for the lack thereof.